Last year, Trials Evolution launched on XBLA to critical acclaim. It was a significant step up from its already-solid predecessor, and landed on my own personal top ten games of 2012 list. Tate Multimedia apparently saw its success and realized that the Trials experience was limited to Xbox and PC, so they pulled the trusty “sincerest form of flattery” card. 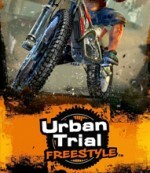 Urban Trial Freestyle is a game that apes the Trials series in every way, but falls shy of that high bar in every regard. One of the great things about Trials Evolution is that it presents a (sometimes extreme) challenge without ever feeling particularly cheap. While the bikes in Urban Trial Freestyle control fairly well, the tracks themselves are a wild card. Evolution tasked players with making crazy jumps, adjusting their balance until it was just right, and learning the correct way to accelerate up steep hills. Urban Trial Freestyle features these challenges as well, but you’ll also have to put up with more random and frustrating environmental elements. Small boxes will be thrown onto the track, wildly rotating objects seem to require sheer luck to get through, and other chaotic events will cause you to cross your fingers for good fortune instead of testing your skills. Courses in Trials Evolution feel like an exciting challenge, while many in Urban Trial Freestyle feel like a chore by comparison. A few new elements are introduced, such as cash pick-ups and challenges (longest jump, highest jump, etc) scattered about the courses. Urban Trial Freestyle may throw in the occasional little tweak, but they aren’t enough to elevate the game past the level of a flattering wannabe. If you're into the idea of a platforming-heavy motorbike game, stick with the tried and true Trials series. Urban Trial Freestyle attempts to ape every aspect of the Trials series, but falls shy of that high bar every step of the way. Sound One of the absolute worst menu songs I’ve ever heard. The rest isn’t much better.